If you are serious about your workouts, the Life Fitness T7-0 treadmill delivers all the features you expect and a bunch of other perks and extras you likely haven’t seen before. As far as high end home machines are concerned, this is definitely one of the better ones out there. The Life Fitness T7-0 treadmill offers a great display: an easy-to-use premier console with advanced electronics and full customization. 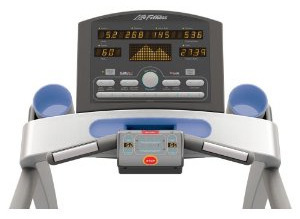 The deluxe LED display has warm amber lighting on the readout windows, and a second keypad located in the middle of the heart rate handlebars which has 3 pre-set inclines (low, medium, high) and 3 pre-set speeds (for a 8.5, 12, or 17-minute mile pace). UPDATE: The T7 is no longer being produced, replaced by an all new T5 model with added features and capabilities. The new treadmill gives you two console options, plus many updated touches to provide more stability, comfort and less impact on your knees and joints. Check out the T5 if you want something very comparable to the T7. The Life Fitness T7 treadmill has the big features you expect: a wide 22" x 60" belt, high-end HR monitoring system, and a 15% incline. Runners rave about its superior commercial-grade deck supported by the patented FlexDeck® Select adjustable shock absorption system that reduces impact on joints up to 30% compared to ordinary treadmills. 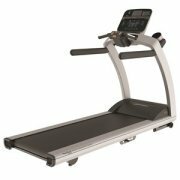 The adjustable feature allows the treadmill user to choose between a soft, medium, or firm running surface. Under the hood of the T7-0, the whisper quiet 3.0 CHP motor system communicates with the console and adjusts the power needs depending on the user’s weight. The Life Fitness T7-0 is modeled after club treadmills in that you’ll find handy accessory trays for items, as well as water bottle holders. Life Fitness is known for their great workouts and that’s what you’ll find here: 18 intense programs, 7 My Workouts™ personalized programs, 7 custom workouts per user, and 4 user profiles. It’s no wonder why Treadmill Doctor calls this model “one of the best treadmills built exclusively for the home” and Consumer Digest gave it Best Buy award in February 2007. Reviews rate the T7-0 treadmill outstanding in all areas of style, engineering, and performance, except one – value, and it that regard it scores about a B+. Otherwise, this treadmill is a great machine, except for the price that keeps creeping up year after year. Life Fitness justifies it because it offers more programs that are customizable as well as the ¾" commercial-grade Isocyanide deck (the less expensive Life Fitness models use 1” medium density fiberboard) which offers a superior surface for extended running sessions. If you’re training for marathons and running 100 miles a week, or just want a good-looking treadmill to complete your home gym, the Life Fitness T7-0 treadmill is an excellent choice. 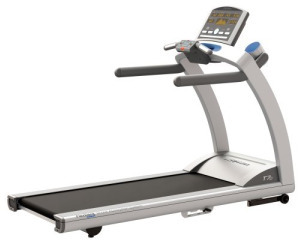 Life Fitness treadmills are on sale right now!